The US-backed Syrian Democratic Forces (SDF), which consist mainly of members of various Kurdish armed groups, declared on October 31 that they had halted their operation against ISIS in the Euphrates Valley because of Turkish attacks on their positions in northern Syria. The SDF blamed Turkey for its own inability to eliminate the ISIS-held area of Hajin in the Euphrates Valley and called on the so-called international community to pressure Ankara to stop its strikes on SDF targets. The SDF also vowed to retaliate to attacks. On October 30, October 31 and November 1, clashes between the Turkish military and units of the Kurdish People’s Protection Units (YPG) were reported near the towns of Ayn Arab, also known as Kobani, and Tel Abyad. According to pro-Turkish sources, at least 4 members of the YPG and the Kurdistan Worker’s Party (PKK) were killed and 6 others were injured there. The YPG claimed that its members had destroyed a Turkish military truck with an anti-tank guided missile. As to the situation in the Hajin area, over the past few days ISIS units have achieved a notable progress in clashes with the SDF recapturing multiple positions from the US-backed group. The halt of the SDF operation there will likely contribute further to ISIS expansion in the direction of the Iraqi border. 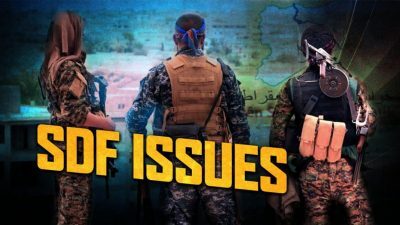 The SDF and the US-led coalition have for a long time ignored the ISIS-held pocket around Hajin because its elimination would remove the main formal pretext allowing Washington to keep its forces in the war-torn country. Now, they bear the consequences of this approach. 33 soldiers of the Syrian Arab Army (SAA) were killed in clashes with ISIS in the area of al-Safa in southeastern Syria, according to the terrorist group’s news agency Amaq. Pro-government sources have not commented on this claim yet. Should this be true, this would be the second failed SAA attempt to advance in al-Safa this week. The key issue behind the SAA setbacks in the area is that most of its elite forces are now deployed near the Idlib de-escalation zone, which is mostly controlled by Hayat Tahrir al-Sham and other al-Qaeda linked terrorist groups. So, by keeping a limited force in al-Safa, the SAA is able to deter ISIS operations, but is not able to put an end to the ISIS presence there. Major General Igor Konashenkov, spokesman of the Russian Defense Ministry, revealed that Russian specialists are still training Syrian servicemembers to use S-300 air defense systems. Russia also supplied the advanced Polyana-D4M automated command and control system to the Syrian Air Defense Forces. Such systems, which serves as an upper level command post (CP) of air defense brigades and can handle up too 500 air targets, will be integrated into the air defense network created for the Syrian military.